In its first performance of the year, QU Theater for Community performed “The Trestle at Pope Lick Creek” through the weekend beginning Oct. 4. Directed by part-time faculty member Robert Bresnick, the show captivated its audience. Set in a struggling small town during the post-Great Depression era, the play focuses on two main characters: Dalton Chance, played by sophomore Alec Farquharson, and Pace Creagan, played by sophomore Sara Detrik. The two teenagers, Pace, an adventurous tomboy, and Dalton, an impressionable young man, are planning to outrun the train that crosses a trestle high above a dry creek bed. Pace had crossed the trestle once with another boy, who died trying. Now she wanted Dalton to try it again with her. 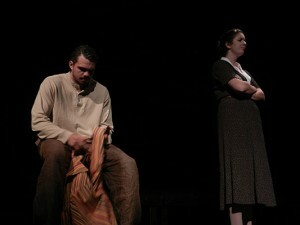 Throughout the play, the power and effect of relationships is a major theme. Reflecting on Pace’s attempt to outrun the train has Dalton wanting to return to his former innocent self. When it came time to run, Dalton couldn’t do it. But Pace makes the run for it, and it ends fatally. Dalton is left feeling an enormous amount of guilt, which leads to Pace appearing as a ghost to him. Scenes shift between past and present, both before the characters attempt to outrun the train and after, adding a sense of mystery throughout. Tragedy and despair is experienced on all sides, with an intertwined storyline about the hardships of Dalton’s parents, whose relationship was dwindling as a result of unemployment. This leaves Dalton feeling like a burden. 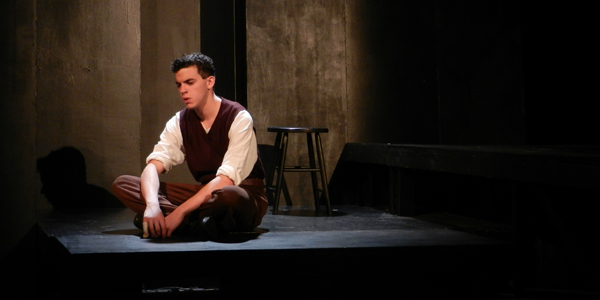 Dray Chance, Dalton’s father who is played by junior Michael Bobenhausen, constantly begs to be changed by his family. “I don’t want to live like this…unchanged,” he says, conveying his feelings of emptiness. The script’s many psychological insights left much of the audience with feelings of sadness. This also spoke of the quality of acting in the show. Farquharson and Detrik worked well on stage together, and in the final scene, Pace appears as a ghost. She describes to Dalton what she wants him to do to her body. Dalton then does everything she says to his own body. Although neither character is touching one another, it still evokes a strange intimacy on stage, a tough mood to create.